Traditional & modern Chinese wedding is what Wendy of Asian Fusion Weddings and Carmen of Devoted to You put together two aesthetically pleasing setups that blend Chinoiserie with wedding design. We asked producer Wendy all about the inspiration behind the two concepts and how they reflect modern and traditional frameworks. Q: Elegant Wedding: As a wedding planner, you have the opportunity to participate in style shoots that explore various themes. What led you to choose one about Chinese New Year? A: Wendy: Chinese New Year is always celebrated with friends and family at home, and eating together is always part of the celebrations. Although food is a very important element at these get-togethers, oftentimes the visual and aesthetic experience for our guests may be overlooked. For this very reason, Carmen and I wanted to showcase two very distinct looks that anyone can do at home. These modern and traditional decorative ideas are really simple to execute, but they really do enhance the dining table tremendously. Q: Elegant Wedding: What was the inspiration behind this style shoot? A: Wendy: Thinking about all those Lunar New Year family dinners over the years, I was ultimately inspired by two of the most popular Chinese porcelain patterns that my grandmother had in my childhood: one featuring traditional rich reds and the other featuring a gold palette. It was inspired by the vintage Chinese Mun Shou Longevity porcelain pattern. Since red represents happiness and joy, it’s traditionally used in all Chinese celebrations from weddings, birthdays, anniversaries and so on. The other design features more of a muted modern palette using various tones of pinks and blues. The Ching Tung blue and white porcelain pattern was the inspiration and its beauty has also captivated the hearts of those in the west for many generations. The French call it “Blanc de Chine” and it’s actually on-trend at the moment. Various blue and white porcelain patterns lend themselves to a Chinoiserie aesthetic that is continuing to grow in popularity with regards to design and decor. 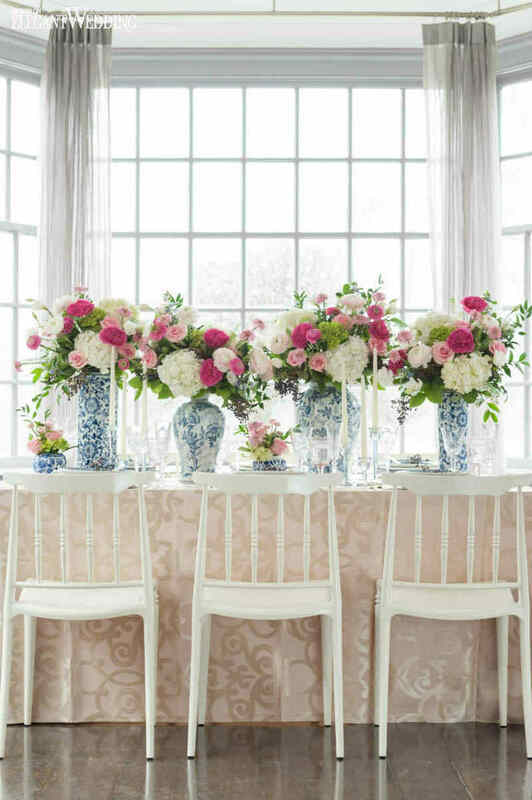 The various pieces of the floral and decor that you see from this shoot can easily be reinterpreted for a bridal shower, baby shower and/or even a watercolour or pastel-colour themed wedding. 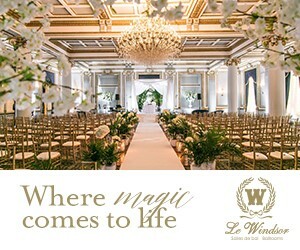 Q: Elegant Wedding: What is the one piece of advice that you can offer to couples looking to design their own event? A: Wendy: My continuous inspiration is derived from my clients’ cultural backgrounds, their individual tastes and impeccable styles. Hence the company name “Asian Fusion Weddings.” It brings me great joy to be able to infuse their wishes into one creatively detailed and cohesive design. Whether it be a gathering at home, an intimate affair and/or an extravagant wedding. The key to designing any modern or traditional celebration is to maintain the colour scheme, use a variety of textures and remember what the purpose of the event is all about.